I love flowers! What girl doesn’t, especially for Valentine’s Day? But I never remember to water them, they are so expensive and don’t last long! Paper flowers to the rescue! No watering, no dying out and definitely not as expensive! I want to show you three varieties of flowers that are perfect for your valentine! A daisy is a simple, but pretty flower. And so easy to make! 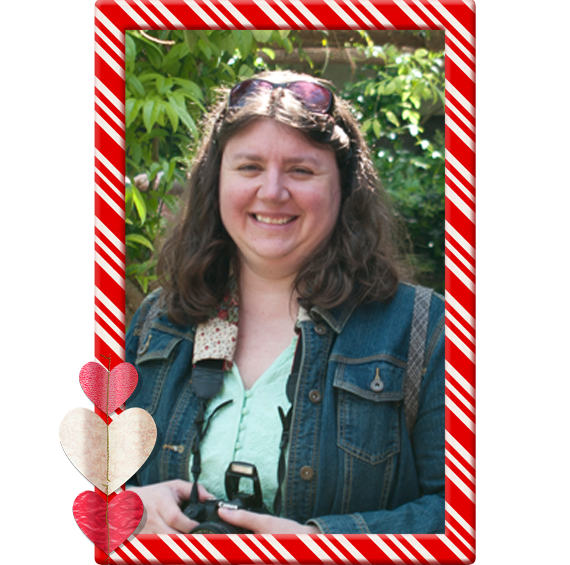 Start by printing out the digital scrapbooking papers you would like to use. For this flower, I used Georgia-Pacific Cardstock, 110 weight. I tried this with regular printer paper, and it was fine, but the thicker paper held its shape better, especially when stacked. Cut 2 three inch circles from each paper. You can use a punch, an electronic cutter or freehand if you’d like. 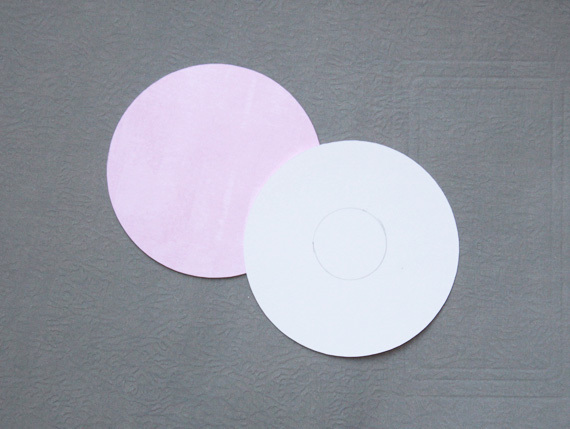 Using a pencil, draw a 1 inch circle in the center of each larger circle on the non-printed side of your paper. A quarter works great for this! Then divide your circle into 7 or 8 equal sections (or as close to equal as you can) and cut on the lines without going through the center circle. You can draw in lines using a straight edge or eye ball your cut. It doesn’t have to be perfect. I cut both cut circles at the same time so the cuts would match (I placed one circle on top of the other, then made the cuts). Pinch each newly cut petal to create a crease down the center of each one. 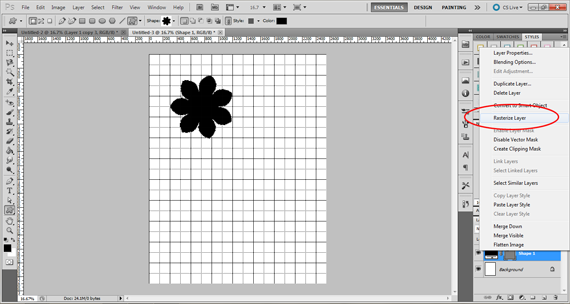 Once that is done, place one flower on top of the other and rotate so that the petals are aligned for a layered look. Add a dab of glue or a glue dot in the center of the two layers to hold them together. Add a center to your flower with an embellishment of your choice (button, brad, bead, etc). To add a stem, twist the end of your stem around a pencil and then either glue it to the bottom of the flower or place the stem under the prongs of the brads. 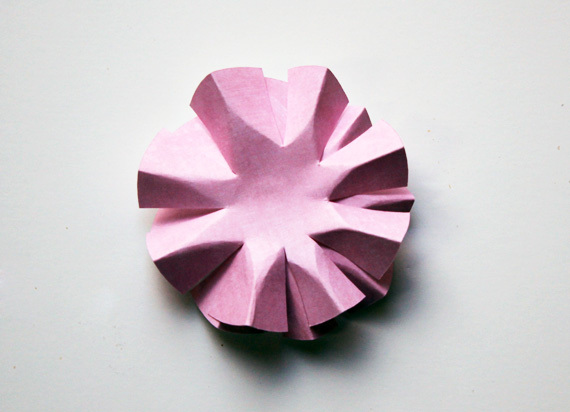 For the second flower, let’s try an Origami Kusudama flower. Kusudama means medicine ball and is created by attaching several identical pyramidal units together to form a spherical shape (Wikipedia). I’ll begin with some basic instructions and then explain some variations. First, start by printing your favorite digital scrapbook paper on plain printer paper. 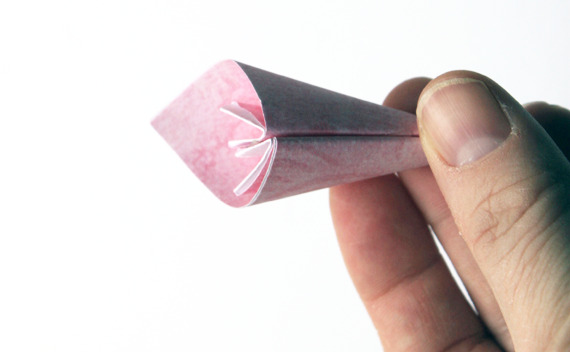 The thinner the paper the better for this flower. Now cut out 4 inch squares. You will need 5 squares! 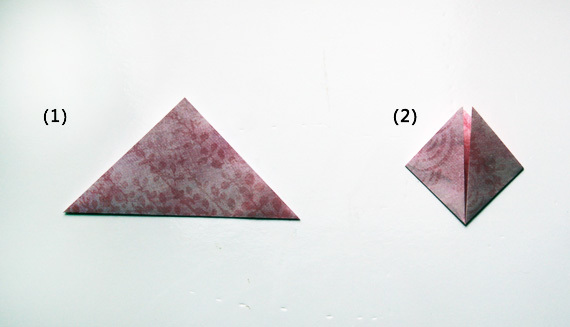 Starting with one square, create a valley fold (white sides together), from one point to the opposite point (1). Then fold each corner to the center corner to form a square (2). This will form wings. Fold each wing back so the edge of the wing lines up with the edge of the square (3). Open the wing back up and fold the wing in on itself, create a “squash fold”, using the fold line from step (3) and flatten (4). 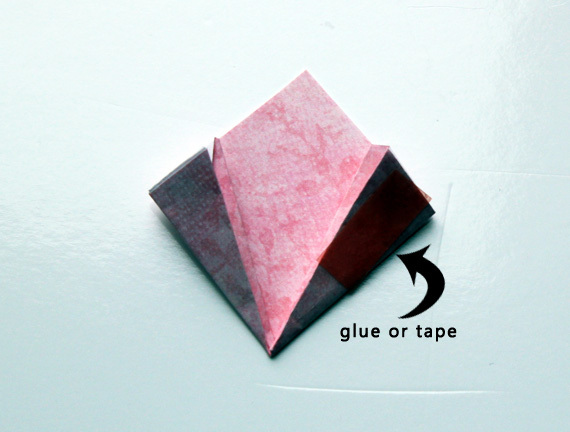 Fold the paper tips down so that the edge is even with the paper behind it, forming little triangles of white paper (5). 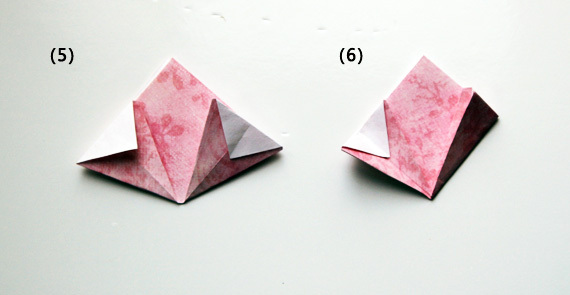 Fold the wing back up on itself, hiding that little white triangle, to form a square once again (6). Round the back of the paper so the wings meet, and stick. I’m using glue dots, but you can use glue or double sided tape. If using glue, I like to use a clothes pin to hold the sides together until the glue is dry. Now repeat the steps above to create 4 more petals! Once you have all 5 petals, we need to attach them together. I am using glue and applied it on each side of the petal’s seam. Make sure to add the stem in at some point because you won’t be able to push it up through the middle once the glue is dry. I’ve attached clothes pins to every seam to keep the edges together while the glue dries. 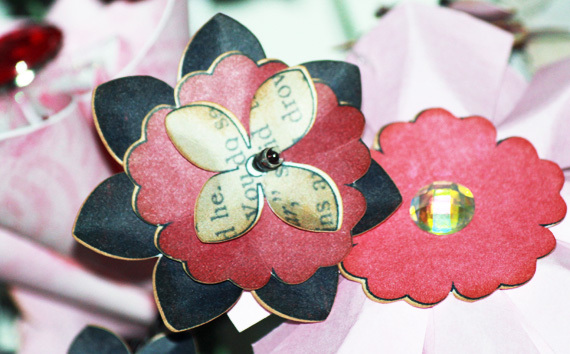 Once it’s dry, add a button, brad or other embellishment for the center of your flower. 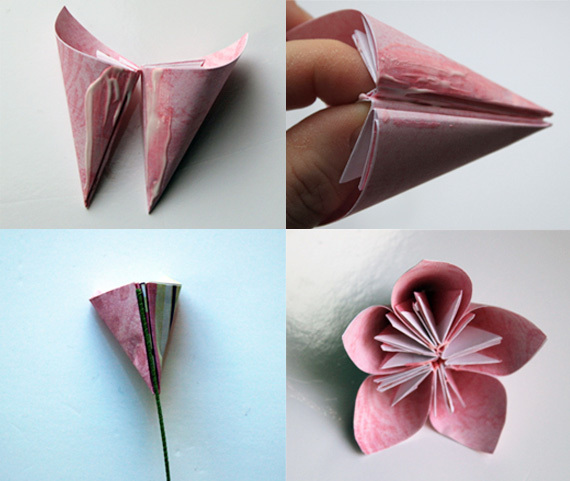 Variations: Try using smaller or larger squares of paper for different sized flowers. Also, change up the number of petals you use. Adding ink to the edges before folding will create some beautiful effects, as will glitter or chalk! Finally, try different papers for each petal so you have a truly unique flower! You are only limited by your imagination! 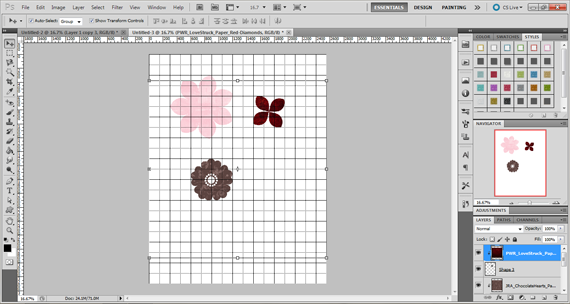 The last flower I have for you uses supplies you may already have in your digital scrapbooking stash! I’m talking about Custom Shapes! The Scrap Girls Boutique is full of beautiful custom shapes just waiting for you to personalize and use in layouts and projects. I’m going to start with a new 8.5X11 inch document, 300 dpi, with a white background. I’m going to turn on my grid (View->Show->Grid in CS 5). I want a grid line every inch, with two subdivisions. Under Edit->Preferences->Guides, Grid & Slices, I can make those adjustments. 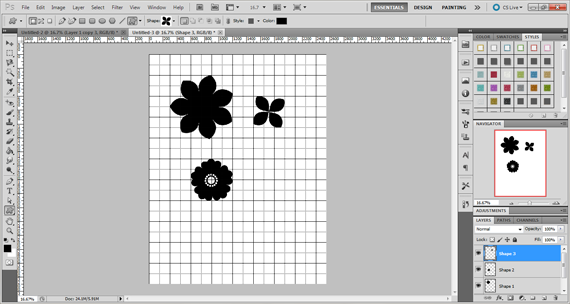 Next, I click on the Custom Shape Tool on the left side and choose your first flower. While holding the shift key, click and drag out the shape until it’s 3×3 inches. Use the grid for a guide. 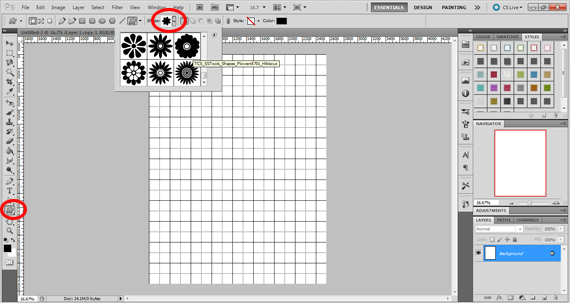 Once your shape is done, right click on the layer in the layers palette and choose Rasterize Layer. 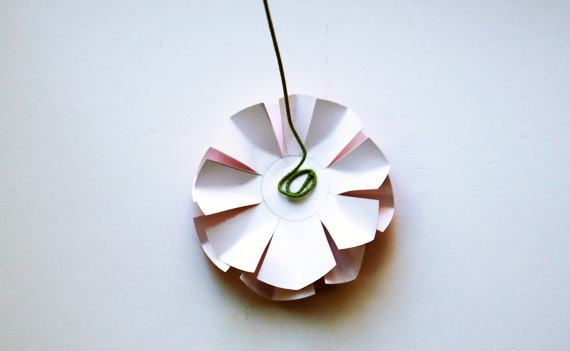 Do this two more times, making the next flower 2×2 inches and the third flower 1.5×1.5 inch. You can mix and match different shapes or keep them all the same shape. 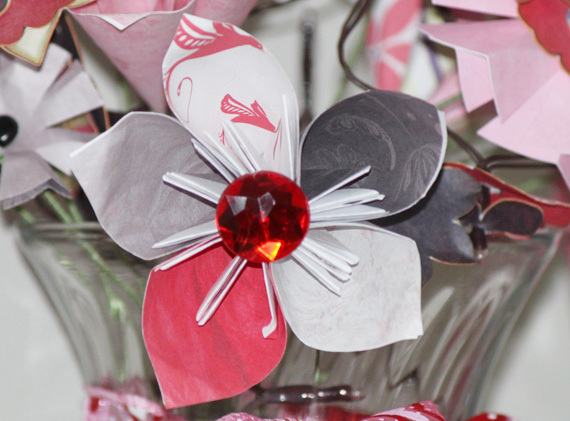 Finish off the flower by adding papers (clip them to the flower shape) or styles. Flatten your image and save as a jpeg for printing and cutting by hand. If you want to use an electronic cutter, like a Silhouette, save your file as a png file and use the print and cut feature to cut them out. I punched a hole in the middle of my flowers so I could hang them on the little string of white floral lights I found at the local craft store. You can layer the different sizes and shapes together, pinching petals and wrinkling up the paper for some added depth. As in the daisy flower, you can add a glue dot to each layer to keep them together, and add the stem in the same fashion. I’ve learned that I love to create paper flowers! It’s so much fun mixing colors and patterns, sizes and shapes! I need to work on how to arrange them, but I know I’ll have fun practicing! If you have any tips for me, please leave a comment below! I hope you try your hand at creating paper flowers and surprise someone you love with a paper flower bouquet this Valentine’s day, or any day you wish! 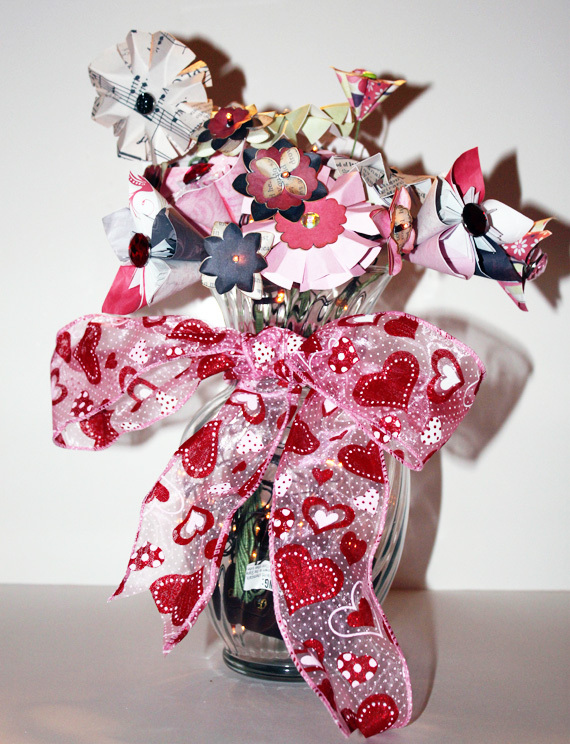 Once you create your bouquet, share it with us in the Scrap Girls Hybrid Gallery. We’d love to see it!